Automation. Urbanization. Impact. Supply chain intelligence. The shift to circular business models. What do these trends have in common? They are all advancing the case for Corporate Sustainability and in turn, making it a core business issue within boardrooms and enterprises worldwide. 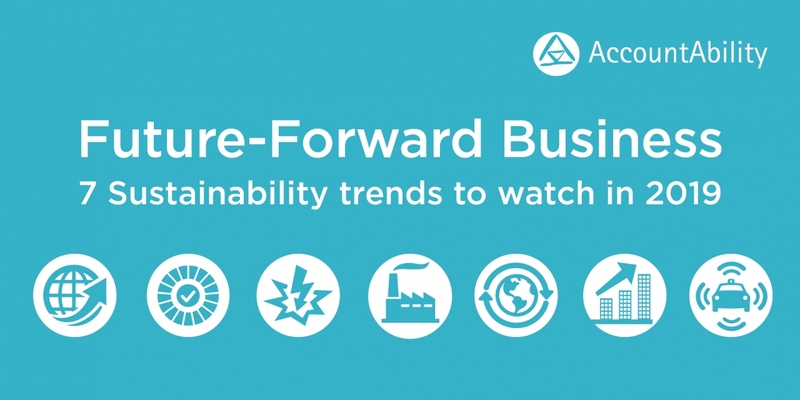 These topics are intensifying the demand from customers, employees, investors, NGOs and governments for business to address Environmental, Social and Governance challenges. With the acceleration of these dynamics, further trends are created. These include the prospect that businesses will need to collaborate in order to make tangible contributions towards shared ambitions, and focus on understanding and articulating the real impact their organization is having on the global agenda. Through research and advisory work with clients in the US, Europe and Middle East, AccountAbility has identified seven key trends to help companies navigate the complex landscape of sustainable business challenges, and guide organizations towards effectively managing their performance and impact in 2019. AccountAbility encourages organizations of all sectors and sizes to take stock of how their business model will be affected and consider the upside opportunities for their company.